Today I visited the Cliffs of Moher. I was really looking forward to the visit. With less than a week left of our trip, I was starting to feel as though I hadn’t seen enough of the “big attractions” that everyone who’s been to Ireland says you have to see. I’m glad that I picked the cliffs for today because it was one of the most beautiful days of the trip so far. Today was really nice because we got to take our time admiring the glorious cliffs and not get soaking wet and freezing cold. After we got back on the bus after being at the cliffs for an hour and a half, our bus driver made a joke about Americans. He said, “Us tour guides always bet that if there are American women on the trip, they’ll take pictures of the cows. Well ladies?” I thought it was a funny joke because of how truthful it actually was. As I took a few pictures of the cows I noticed other American women doing the same. I think the humor behind his joke is that it’s not as though I’ve never seen a cow before. Perhaps some of the other American women were from city areas and this is the first time they’ve seen them. I can drive less than ten minutes from my house though and see cows so what made these ones so cute and special? I feel like it might simply be the quantity of them. 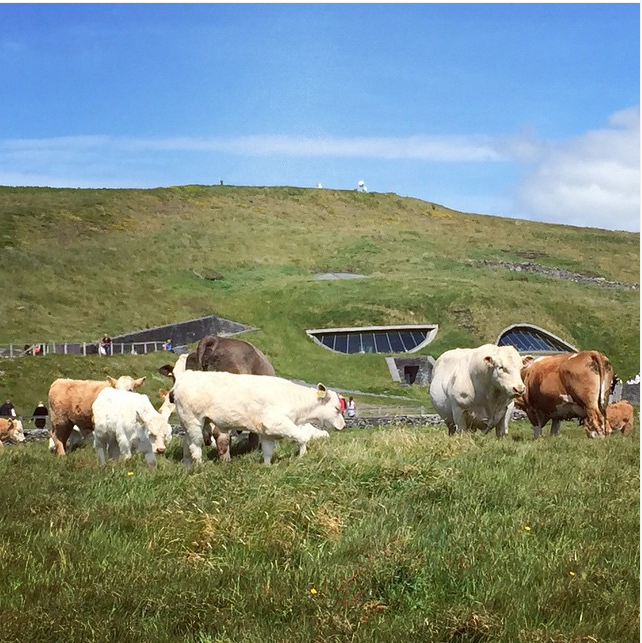 There are cows everywhere in Ireland, even at the tops of the Cliffs of Moher apparently.